The world of hydrangea shrubs is nothing if not diverse. Most types do grow in shrub form, but one type is a vine, while another is pruned so as to assume a tree-like appearance. The genus includes bushes native to North America, but the Far East is not without its own representatives. Some perform best in partial shade, but others can profit from a bit more sunlight. And what lover of curiosities has not marveled over the fact that, with some types, the very same plant can bear either pink or blue flowers, depending upon the soil in which it is growing? It is from this group that the chameleonic wonders hail, the shrubs whose flowers will be pink in alkaline soils, blue in acidic soils. This kind grows in shrub form; it can be further divided into types with "mophead" flowers and types with "lacecap" flowers. Because Bigleaf varieties are chameleons, you can't take their colors for granted. That's why you shouldn't become complacent and think that buying a Rhapsody Blue means that, automatically, you are going to have a bush with blue flowers right away. Depending on your soil conditions, you may have to work at it for awhile. I tell you how to achieve the color you desire in this article. Is it a shrub or a tree? Well, technically, although sometimes referred to as "tree hydrangeas," PeeGees are shrubs. But they can be pruned so as to have a single trunk (i.e., you can train these hydrangea shrubs to be "standards") and thereby assume a tree-like appearance. Consequently, while the panicles (flower heads) aren't colorful and the leaves are hum-drum, this is the type you'll want to grow when you need a specimen to make a statement with its striking plant form. Bobo, by contrast, won't remind anyone of a tree. If you have a small yard and wish to shoehorn one more plant into it in a tight space, this dwarf could be your answer. The whole genus is blessed with flower heads that dry for you -- right on the living shrub -- adding a bit of visual interest to your fall yard. But fall color is not a feature for which these shrubs are generally known. Well, you can throw out that general rule when it comes to the oakleaf type, which is an excellent shrub for fall color. The leaves of this shrub turn purple, orangey-bronze or red in the fall. You vine lovers are probably most interested in the type of hydrangea plant that grows as a vine. But climbing hydrangeas are not just vines: They're flowering vines that grow well in the shade, year after year. If you've ever surveyed the list of vines that meet those qualifications, you know that the pickings are pretty slim (at least in the North). This vine will become a fixture in your shade garden. Like the bigleaf kinds, this group is composed of shrubs, and there's nothing remarkable about the form or the leaves: no vines or tree look-alikes here, no leaves shaped like oak leaves that turn pretty colors in autumn. But there's something you need to know about this group that distinguishes it from the traditional bigleaf specimen: It blooms on new wood. For those of you who panic over pruning, this is no insignificant fact! Invincibelle Spirit addresses the color issue: It's the "pink Annabelle." Incrediball, meanwhile, is supposed to tackle the flopping problem, being touted as the "no-flop Annabelle" -- despite the fact that its flower heads are even bigger than Annabelle's. Droop-proof or not, I like the way Incrediball's large, puffy white flower heads hover like clouds over the shrub's foliage. 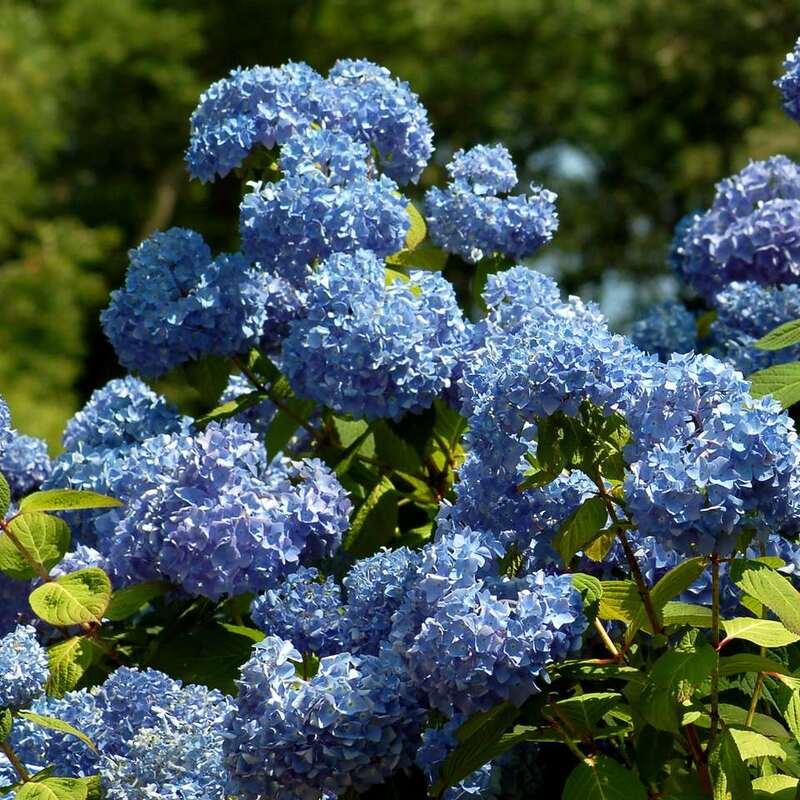 Whatever types you select, hydrangeas play an important part in the summer landscape for those who wish to achieve a continuous sequence of bloom. Looking for something to plug the gap between when the lilacs stop blooming and the rose of sharon begins? Hydrangeas could be the answer for you.